Birmingham is the largest city in Alabama with a population of 212,113 and rests within the geographical boundaries of Jefferson County. It is a main thoroughfare for cars and trucks traveling to Atlanta, Nashville, and the west coast. Vehicles travel both locally and from out of town on I-65, I-20, I-459, Highway 31, and Highway 280 to access major healthcare facilities like the University of Alabama at Birmingham, St. Vincent’s Hospital, Brookwood Medical Center, Trinity Medical Center and hospitals in the Baptist Health System. Additionally, Birmingham draws college and graduate students to the University of Alabama at Birmingham, Birmingham-Southern College, Samford University and Miles College. Finally, Birmingham boasts three major shopping malls which draw consumers and workers from rural areas in Alabama. With these facilities and opportunities comes increased traffic, which unfortunately leads to more automobile accidents. According to the Alabama Transportation Director, in 2011, there were 23,057 total crashes, 45 crash-related fatalities, and 2,329 non-fatal, crash-related injuries in Jefferson County. Of these, the city of Birmingham had 9,811 total crashes, 42 crash-related fatalities, and 1,851 non-fatal, crash-related injuries. This means that 43% of the total crashes, 93% of car accident deaths, and 79% of non-fatal crash-related injuries in the county occurred in the city of Birmingham. If you have been injured in an automobile accident in Birmingham, Alabama, then you have certain legal rights. However, you must exercise those rights immediately if you want to receive the just compensation that you deserve and likely need. Oftentimes, the preservation of the evidence associated with your accident is critically important to the prosecution of your car wreck claim and you simply cannot afford to delay. 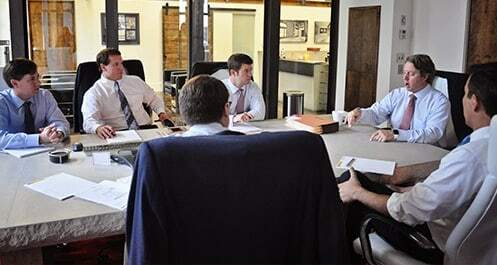 The attorneys at Hollis Wright are ready to fight for you and obtain the compensation that you deserve. Rest assured that soon after a car accident occurs, the insurance company for the driver that caused the accident is hard at work gathering critical facts and evidence for purposes of trying to establish a defense to your claim. If you sustained serious injuries, then you likely received significant medical treatment and may have lost your ability to work. The person responsible for the accident is responsible for all costs including medical bills, lost wages, damages for pain and suffering, permanent injury and disfigurement. If a loved one died in an accident, then the heirs or family members have a right to pursue a wrongful death claim. The Birmingham, Alabama automobile accident attorneys at Hollis Wright Law Firm should be consulted today to help you obtain the maximum recovery under the law. The attorneys at Hollis Wright can represent you every step of the way, from proving the other driver was responsible for your crash to negotiating with an insurance company or taking your case to trial. If you or a loved one has been injured or killed in a car accident, please contact the Birmingham automobile accident attorneys at Hollis Wright for a free and confidential case review and consultation. Don’t let the insurance companies push you around and take advantage of you at a vulnerable moment in your life. Call us toll free at 844-529-8255.